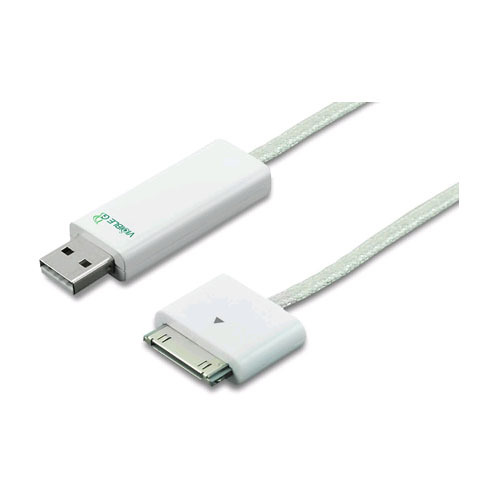 Charging cables are the most heavily used pieces of equipment that users of iOS devices take completely for granted. How exciting can chargers be, right? Dexim may change that perception with their new Visible Green Charging Cable — a system that is not only cool to use, but is also environmentally friendly. The Dexim Visible Green Charger is designed to eliminate the “vampire” power draw that accounts for close to 10% of the energy consumption in the U.S. This is electricity that is being drawn from the grid by devices that are simply plugged in but are not being used. Maybe it’s a game console that’s turned off or a battery charging cable that’s simply plugged into a fully-charged device. Either way, there is a needless usage of electricity that not only adds to your monthly electrical bill, but also harms the environment with the extra power that’s forced to be generated. 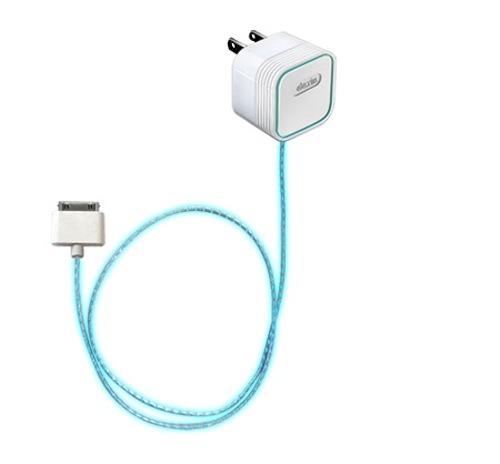 The Visible Green Charger takes one further step when charging your iODS device. Although I haven’t verified it personally, once it is fully charged, the Visible Green charger shuts itself off and stops drawing any further power. On any other charger, you’d have to take the manufacturer’s word for it that this is truly happening. How can you tell if power is flowing through a cable? Dexim has found an answer that I find pretty awesome. The center of the somewhat flattened cable of the Visible Green Charger contains an electroluminescent wire that pulsates as electricity flows through the cable. The greater the power draw, the faster the pulsation. The effect is impressive and very reminiscent of Star Wars. It looks as if you can actually see the power flowing into your iOS device through the 30-pin connector port. From 1%-65%, the flow is relatively fast. 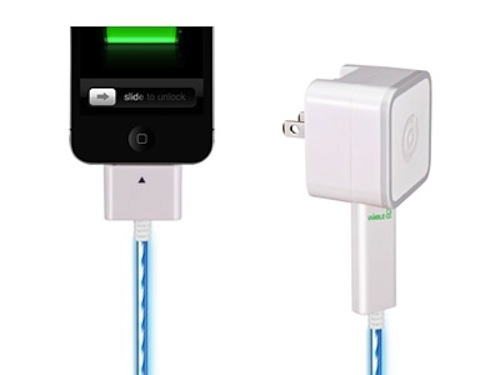 Once your battery reaches 65% charge, the flow slows until it is fully charged. At that point, the electroluminescent cable turns off, indicating that no further power is being drawn through the cable. It’s ingenious. The Visible Green Charger has a USB connector at one end for plugging into powered USB ports on your computer, or it can be plugged into a supplied wall jack. The other end of the cable is the typical proprietary 30-pin connector that we need to plug into our iOS devices. Several models are available, but the DCA257’s 5V and 2.1 Amp output can charge essentially any iOS device, and is probably your best value. I really like the Dexim Visible Green Charger. Friends who have seen it it action immediately ask where they can buy one. I didn’t think I’d ever find a battery charger at all exciting, but Dexim found a way to do it. Kudos to you, Dexim! Hey Mike. I saw these at Macworld and was waiting for them to appear. Glad to see them hit the market. Very fun. They are very cool indeed. Which is what I think you meant in the first paragraph when you said “a system that is not cool to use”. 1). Did you actually plug this into a Kill-o-watt or similar device to see if the current draw really does go to zero when they say it does? 2). That illuminated cable must also draw some power. I can’t help but wonder if the power it uses to light the cable (low, but not free) offsets any savings of power I may use by leaving my power supply connected to the wall for an extra hour after the battery is full. 3). If the battery is full, it should draw no more power. But the power supply typically does not control that, the device being charged needs to stop drawing power. So I am wondering how they do what the claim? Do they cut off the supply IF the power draw is below a certain amperage? If so, does that mean it switches on an off as the batter drains when the power goes off? Just not sure how this would really work. 4). One correction: You said the cable is filled with LEDs. Actually, it is not, as they would draw a LOT of power, truly negating the savings. They use electroluminescent wire (EL technology the website says) actually, which draws very little energy compared to LEDs. Thank you for pointing out some of the bugs in the review. I took the time to correct them in the current post. After a conversation today with Patrick Tarpey, Dexim’s Director of Marketing, I’ve learned that Dexim will begin selling their cables and connectors separately, so that the cables will all be USB to 30-pin connectors. Although I recommend that you use Dexim’s glowing cables with the charger, you can also use them with any other USB cable. Patrick also tells me that Dexim will soon be releasing their glowing cables in other colors, which I’m looking forward to seeing. No matter what changes Dexim has made, I still think the Visible Green system is the way to go if you’re looking for a new charging cable for your iOS device. I plan to purchase more in other colors as they become available. Just bought the cable (DWA063, without charger), it works as described, transfer data and charge the device well. Indeed, the lighting effect is impressive. But it continuously emits 16 – 17kHz high frequency noise when it light up which is very annoying that practically unusable. It even disturb my colleagues when I plug in my office PC. So I do not recommend it for those having good hearing or plan to use it when someone near by. I have this problem too. The high frequency noise it makes is very loud (in my case). I can’t use it in my room when it’s quiet because it will drive me nuts. Too bad because the cable not only looks awesome, it’s great for the environment. Hope it gets fixed soon, as for now I’ll use it with loud music.